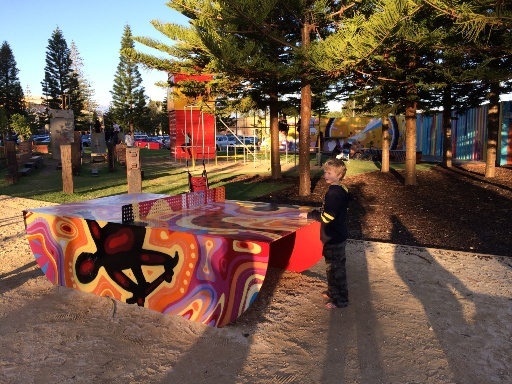 The Esplanade Youth Plaza Fremantle, was opened in April 2014, and has been designed to as a hangout place mostly for older children, teenagers and young adults - but is fun for families with younger children too. Although the Esplanade Youth Plaza has been designed as a hangout for teenagers and young adults, there were lots of younger children also enjoying the skate park and play equipment, and it was great to see the older kids looking out for younger children, giving them guidance and making sure they were ok if they fell off the scooters or skateboards. We did hear a little bit of foul language from some of the kids talking amongst themselves so this place might not be for you if you have young children, but my 3yo & 8yo absolutely loved some of the play challenges near the skate park and we saw nothing but good behaviour from all those there - we will certainly be coming back with the scooters next time. 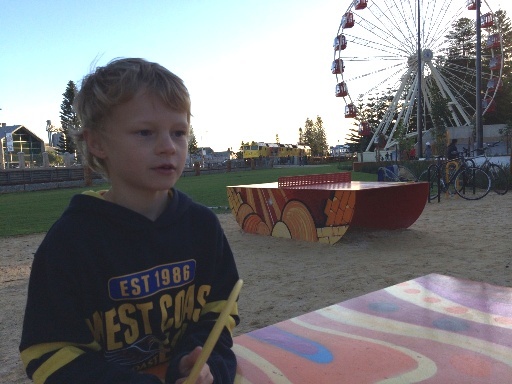 The Esplanade Youth Plaza is located near the ferris wheel on the Fremantle Esplanade, right across the train tracks from Little Creatures Brewing and near the Fremantle Esplanade playground. 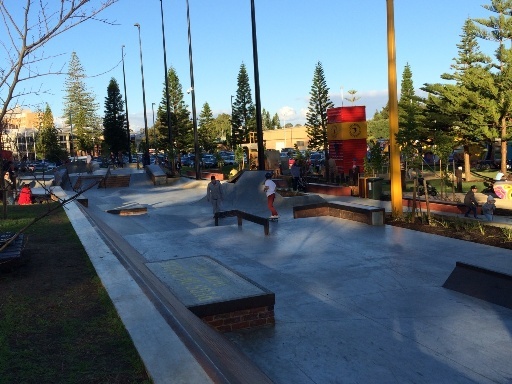 The skate park itself is really big, probably the biggest we have seen in Perth. I wouldn't advise young children to skate on the weekends when it's busy unless they are confident of their skateboard, scooter or bmx. There are a lot of older children and adults using the park and it could be quite dangerous. My kids enjoyed sitting at one of the seated areas and watching for awhile, your quite likely to see some quite talented skateboarders or bike riders on a busy weekend. There is however a long stretch of concrete alongside the train line side of the skate park (see photo above). There were lots of little kids going up and down here safely on their scooters - so they can join in the action too. 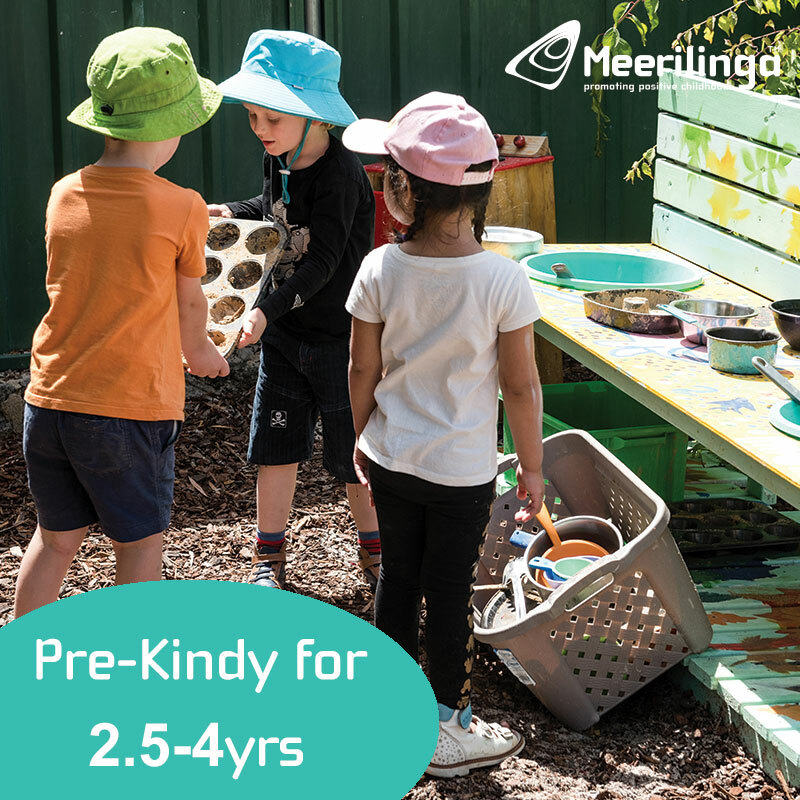 It may also be a lot quieter during the week, so this might be a time to check it out with your pre-schooler if they want to have a go. There is also a fantastic hangout zone. 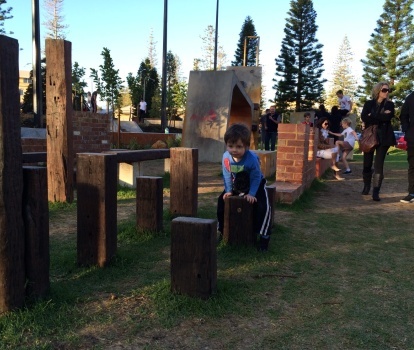 The whole area has a real industrial feel with sea containers, concrete blocks, handrail tubing & blocks of wood used to create some physical challenge and play features. 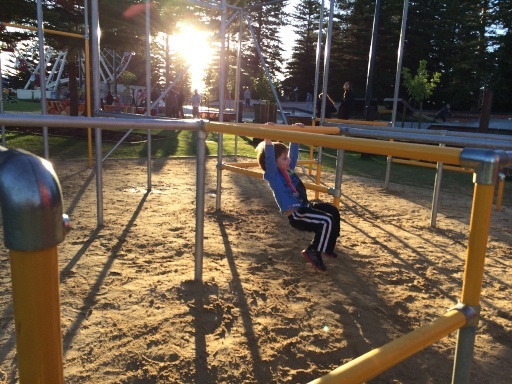 The Funky Monkey Bars pictured above a fun for little ones and bigger kids - with bars located at diffent heights to create varying challenges. There was some amazing people here swinging and jumping from bar to bar - great for the little gymnast too. It's right alongside the train tracks which adds to this industrial feel, and the kids enjoyed checking out the long freight train that went past while we were there. There are also a couple of ping pong tables here which my 8yo loved. Ping pong bats and balls where there, but if your really keen on some ping pong we recommend taking a couple of your own along ping pong balls along to make sure you get to have a go- there were lots of bats but only one ball the others had broken during the day. Toilets are located on the west side of the Esplanade park over in front of the Shipwreck Galleries building. 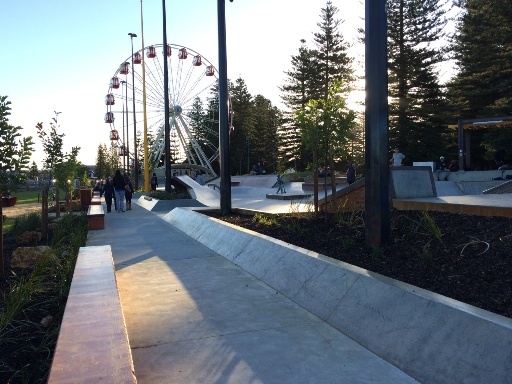 We recommend the Esplanade Youth Plaza for kids 3 years +, but if you have a younger child who is a mad keen skateboarder, scooter or bike rider, they will love it too. 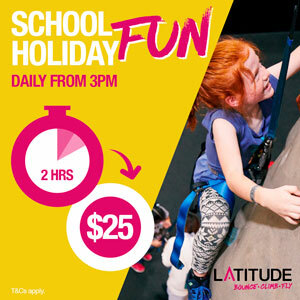 If you are visiting Fremantle make sure you put it on your list of things to do, it's fun and it free! 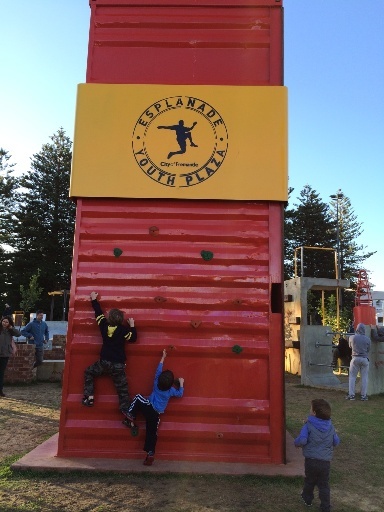 Want information about the Esplanade Youth Plaza, including link to a map while you are on the go - then get the Kids Around Perth App today, you can find it under Attractions / Fremantle! 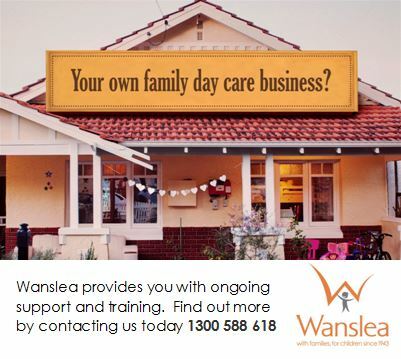 Parking: This can always be a bit tricky in Fremantle especially on the weekends and more so when there is an event on. We recommend parking on Mews Rd. Close to the Esplanade are a couple of large parking bays. Tickets are $1.20 per hour. If you go further south away from the Esplanade there is free parking, you will just have to walk a little bit. If there is an event on we recommend you try this free parking area first as the traffic can be at a stand still closer around the Esplanade Park area.